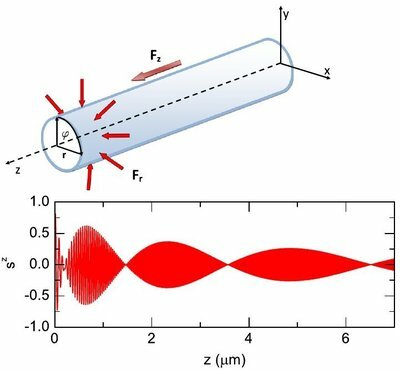 In the framework of the project, we have proposed a possible realization of the spin transistor and the spin separator based on the semiconductor nanowires, i.e., nanostructures with length on the order of few micrometers and diameter of several nanometers. 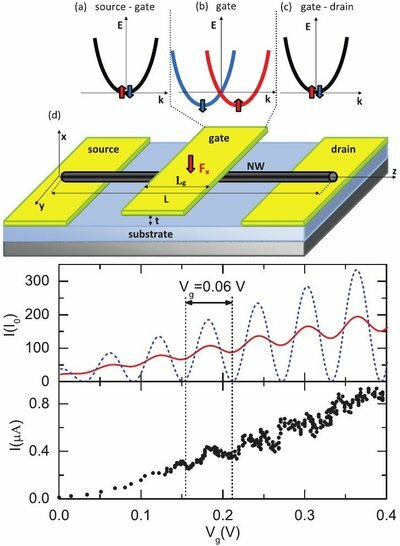 We have developed a theoretical description of the spin transistor, a device for controlling the spin current, i.e., the flow of electrons with identical spins. Our findings are consistent with the results of experiments carried out for nanowires operating under voltage applied to the side electrode. We have also proposed the construction of the spin separator based on the Y-shaped nanostructure. The Y-shaped spin separator can operate in an external magnetic field and at the appropriate voltage applied to one of the output branches. If the unpolarized current is injected into the input branch of the Y-shaped nanostructure, then the spin-polarized currents with opposite spins flow out through the two output branches. This device, operating under optimal conditions, enables the full separation of spin currents without any loss of current. We have also studied the possibility of the manipulation of the electron spin states in core-shell nanowires, composed of concentric cylindrical regions made of different semiconductor materials. We have shown that the external magnetic field is not necessary to effectively control the spin of electrons, but instead it is sufficient to use the external electric field that generates the internal magnetic field acting on the spin of the electron via the relativistic spin-orbit interaction. 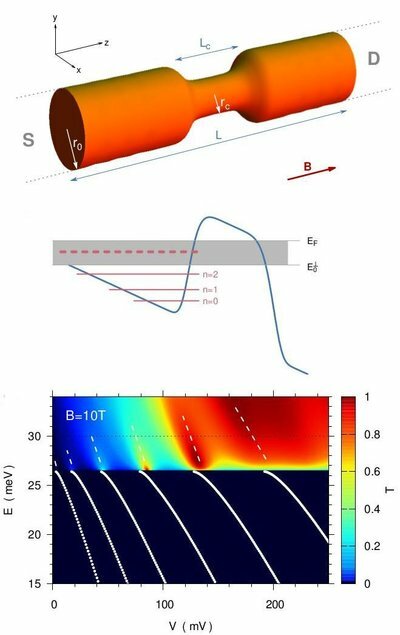 The results of the project allow us to understand the physical principles of the control of spin currents in semiconductor nanowires, provide a description of experimental data, and a design of novel spintronic devices. We expect that our results will help in the further development of spin electronics, which can provide the society with new useful devices. W ramach projektu zaproponowaliśmy możliwe realizacje tranzystora spinowego i separatora spinów na bazie nanodrutów półprzewodnikowych, czyli nanostruktur o długości rzędu mikrometra i średnicy rzędu kilkunastu/kilkudziesięciu nanometrów. Opracowaliśmy opis teoretyczny tranzystora spinowego, przyrządu do sterowania prądem spinowym, czyli przepływem elektronów o jednakowych spinach. Otrzymane przez nas wyniki są zgodne z wynikami doświadczeń wykonanych dla nanodrutów kontrolowanych napięciem przyłożonym do bocznej elektrody. Zaproponowaliśmy konstrukcję separatora spinów w oparciu o nanostrukturę o kształcie Y. Separator spinów działałby w zewnętrznym polu magnetycznym po podłączeniu odpowiedniego napięcia bocznego do jednej z gałęzi wyjściowych. Jeżeli do gałęzi wejściowej nanostruktury Y wpływałby prąd niespolaryzowany, to przez obie gałęzie wyjściowe wypływałyby prądy spolaryzowane spinowo o przeciwnych spinach. Przyrząd taki, działający w optymalnych warunkach, umożliwiłby pełną separację prądów spinowych bez strat prądu. Zbadaliśmy również możliwość manipulacji spinem elektronu w nanodrucie o strukturze rdzeniowo-powłokowej, czyli strukturze złożonej ze współosiowych cylindrycznych warstw złożonych z różnych materiałów półprzewodnikowych. Pokazaliśmy, że do efektywnego sterowania spinami elektronów nie jest konieczne zewnętrzne pole magnetyczne, lecz wystarczy zastosowanie zewnętrznego pola elektrycznego, które wytwarza wewnętrzne pole magnetyczne działające na spinowy moment pędu elektronu wskutek relatywistycznego oddziaływania spin-orbita. Wyniki projektu pozwalają na zrozumienie podstaw fizycznych sterowania prądem spinowym w nanodrutach półprzewodnikowych, podają opis danych doświadczalnych oraz propozycję nowych przyrządów spintronicznych. Spodziewamy się, że w oparciu o nasze wyniki nastąpi dalszy rozwój elektroniki spinowej, która może dostarczyć społeczeństwu nowych użytecznych urządzeń. (top) Schematic of the nanowire with constriction: r0 is the radius of the nanowire outside the constriction, rc is the minimal radius of the nanowire in the region of constriction with length Lc, and L is the length of the nanowire, i.e. the distance between the source (S) and the drain (D). B is the magnetic field. (middle) Schematic of potential energy profile (blue curve) along the axis of the nanowire, energy levels En (n=0,1,2) (solid red lines) of the quasi-bound Stark states formed in the triangular quantum well, and the resonant-state energy (thick dashed line) in the transport window (gray rectangle). (bottom) Upper panel: transmission coefficient T as a function of electron energy E and drain-source voltage V for B=10 T; white dashed lines correspond to the energies of Stark resonances. Lower panel: white dots show the energy levels of the quasi-bound Stark states localized in the triangular quantum well between the source and the constriction barrier. 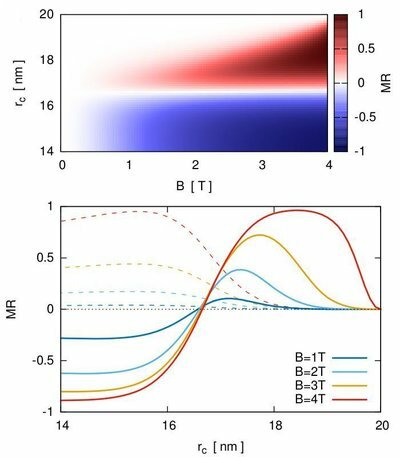 (top) Magnetoresistance as a function of the magnetic field B and the radius rc of the constriction. (bottom) Magnetoresistance as a function of radius rc of the constriction (dashed lines correspond to the results obtained when spin of the electrons is neglected). (top) Schematic of the nanotube with two-dimensional electron gas. Fz - axial electric field, Fr - radial electric field. (bottom) Average value sz of z-spin component as a function of position along the nanowire axis. (top) Dispersion relations E(k) for (a) source-gate, (b) gate, and (c) gate- drain regions of the nanowire. In panels (a)–(c), the vertical (red and blue) arrows show the spin orientations. (d) Schematic of the nanowire spin transistor. 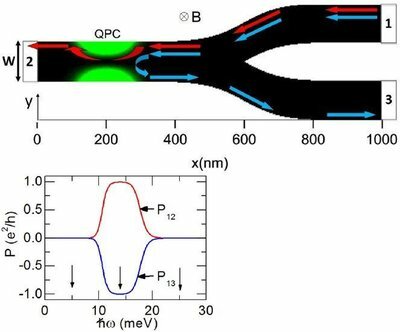 Electric field Fx of the gate acts in the central (gate) region of the nanowire with length Lg. L is the length of the nanowire. (bottom) Current I as a function of gate voltage Vg for the source-drain voltage Vds=0.6 V. Upper panel: the results of the calculations, lower panel: experimental data. The calculations have been carried out for the spin polarization P=0.4 [solid (red) curve] and P=1 [dashed (blue) curve]. (top) Schematic of the Y-shaped nanostructure with the Quantum Point Contact (QPC). The green regions show the QPC potential energy profile. The unpolarized charge current injected from contact 1 is separated in the QPC region into the two spin currents flowing out through contacts 2 and 3. Red (blue) arrows depict the spin-up (spin-down) currents. Magnetic field B is applied is the z direction. (bottom) Spin-up (red curves) and spin-down (blue curves) conductance as a function of the QPC confinement energy ℏω. P12 (P13) correspond to the electrons flowing from contact 1 to 3 (from 1 to 2). Changing the voltage applied to QPC alters ω, which in turn allows us to control the process of spin separation.